This entry was posted in Achievable Layout Examples, Beyond Port Rowan in S, layout design, layout tour, philosophy by Trevor. Bookmark the permalink. What a gorgeous layout! The attention to detail on Roweham with respect to the fine finish/ integration of the backdrop and framing is enough to keep layout design people intrigued. Just a very nice construction and design job not to mention a snazzy use of colors. The rest of the wonderful detail, especially track and structures, not to mention locomotives and rolling stock is just exquisite. Just a great looking layout. In looking back at your post from last year you explained something that confused me about the second photograph dealing with layout support. 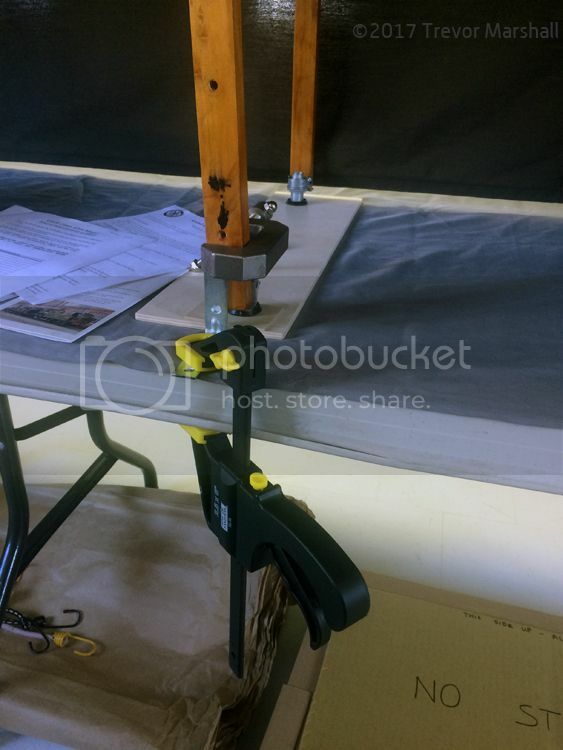 You noted the four sections have mini-legs, which bring the layout up to a nice height from the top of a standard folding table. A very interesting idea. I have seen this done on rare occasion at RPM meets to raise models up to an easier viewing level but do not recall ever seeing this on a display layout. While I am sure the owner would not like us to literally see behind the curtain, it would be interesting to see the layout with the legs without the drapes. The legs are dead simple. If I recall, they’re simple H-shaped affairs – two legs with a cross-brace – that are bolted to the underside of each section. They swing into the benchwork when stowed. I can’t remember if there’s a locking mechanism. They do have levelling feet on the bottoms. There’s a subtle brilliance in those legs and their design. Thank you the (inspirational) photo. Resting the layout atop a table moves those screw adjusters to level the layout to a more comfortable height which is way more comfortable than crawling around on the floor when leveling the layout. Further you could use a shorter leg and then just blocking over the table’s top to bring it higher or lower depending on the venue and your intentions: display, operation, or construction and maintenance. Also, you would gain the stability of the wider table which is always helpful for the long yet narrow layout which isn’t always the most stable design. If your hanging a fabric valance across the presentation sides than all this is hidden anyway. 1 – The table space under the layout provides plenty of horizontal surface for storing throttles, papers, lunch, etc. It’s also a handy spot to unpack locomotives and rolling stock from their travel boxes. 2 – The table is wider than the layout, so at the front, it provides a small buffer. People tend to not lean on the layout, since it’s set back from the edge. People also tend to not lean, period, since the table hits them mid-thigh and that’s uncomfortable. 3 – The shorter legs are much easier to incorporate into the layout benchwork design, as they can fit between cross-braces. This makes integral legs easier to accommodate. 4 – Integral legs take up less space in a vehicle for transport. A lot less space. Those are excellent points, Trevor and thank you for adding them to the “in favour” list. I tend to think in terms of physically small layouts but Roweham is still quite large and proves how well such an approach to supporting and presenting the layout works both at home and on the road. Further to this, Brian has provided me with a couple of photos to illustrate the leg assemblies, and how the layout is used at home. This picture shows one set of legs folded and the other deployed. I have suitcase latches which lock the top of the leg against a fixed block, to prevent a catastrophic collapse. Also, when folded, the leg assemblies are flush with the bottom of the fascia boards. The lowest part of a section is the bottom of my gusset triangles. 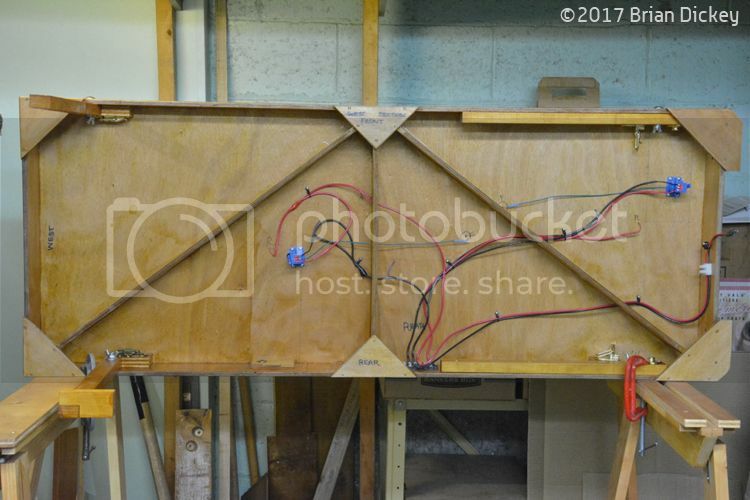 The photo shows wiring complete, before the actuating rods for the Bluepoints were installed. I use 14 ga. wire except for a short length of 22 ga. to the rail. There’s enough length to the rack to allow the whole layout to slide end to end a few inches. This allows me to remove a section for work. So far, it’s been a useful setup as it’s very handy to be able to work on a section from both sides (as I did when installing the new repair shop recently). You can also see the mighty Digitrax Zephyr which runs the layout. Other than a very occasional minor hiccup, it’s been doing the job. I sometimes jokingly say that if your layout is too big for a Zephyr to handle, the layout is too big. That layout is brilliantly executed and inspiring. My new place doesn’t have a lot of space for a conventional O scale layout, so I’m looking at doing a small switching (shunting) layout around three walls of a small study. A perfect post. A great post opens rather than closing doors. It sent me back to last year’s report with dimensions and Simon’s explanation of British operation. Your photos this year are much better and show the layout to be even more wonderful than I thought. I have been resisting static grass for a lot of reasons, but looking at Brian’s “scatter” surface after looking at a lot of Chris Nevard’s work lately opened my mind a crack to reconsider. Finally, I went to my first Springfield show this year and did see some layouts giving thought to effective exhibition display, though sadly not FREMO, which as a lot of other attractions. I think this may be an emerging trend in North America, or at least hope so. I hope you’re right about a move towards improving presentation. There are plenty of railway modelling enthusiasts who gnash their teeth and pull their hair, worrying about “the greying/death of the hobby”. One way to counter that is to show the hobby in its best light – and that includes professional presentations. It doesn’t take much. People can start by looking at the train show booths fielded by top hobby manufacturers. Those are professionally built but we can still take away plenty of ideas for presenting layouts – such as nice finishes, skirting, lighting, and so on. If the presentation style undermines the quality of the work than does it equally undermine our message? If you weren’t in the hobby…no matter how attractive model trains are would you feel comfortable inviting that mess into your house? Or does it reaffirm all those reasons to not build a layout? This is a brilliant way of looking at it, Chris. Never mind that it’s a layout – if the builder was instead showing off a table, or a chair, or a flat screen TV, would the quality of the workmanship be sufficient to make you consider purchasing it? For that matter, if the builder is showing off a layout and included a price tag – reflective of both the materials and the labour – would you consider pulling out your wallet? Sadly, in most cases, my answer would be “no”. But if I was in the market for a layout, and Brian offered his, it would go on my consideration list. That’s exactly my point Trevor. I think it’s like a cup of coffee we purchase at a restaurant. It might be the world’s single best cup of coffee but if the cup it’s poured into is a mess and that’s what’s handed to us we’re unlikely to ever know how amazing the coffee is. We’ll hand it back to the server, maybe even with a remark, and demand a clean cup. That is, after all, what we paid for. In my stream of comments I’ve failed to offer up the most important one and to compliment the layout itself. Brian’s created a really sharp looking model. It’s been carefully constructed and there’s this lovely homogeneous level of finish that washes across each element of the scene – so cohesive and that really is something I find so appealing. It’s good work. That’s something to be truly proud of. The comments on this post are turning into an interesting discussion of presentation at exhibitions. Thank you for that, everyone! One big difference, I think, is that Brian read up on UK exhibition layouts when designing Roweham – and those layouts (at least, the ones that make it into the magazines) are often executed to a higher standard than those in North America, in terms of presentation. Chiefly, exhibitions are the primary focus of the hobby in a country where finding space for a permanent layout of any size is difficult, at best. A hobbyist like Brian, in the UK, would probably only have space to set up one section at a time – two, if he took over a public room temporarily, to allow him to work on the transition between sections. So, Brian’s four-section layout would only ever be fully assembled at a show. Also, exhibition organizers at many shows pay an appearance fee – or, at least, cover the cost of gas and lodging for the exhibitors. As such, the organizers can pick and choose which layouts will appear at shows. It’s a buyer’s market – and if you want to make the cut, you have to up your game. Those people also tell me that when the invites start drying up, they know it’s time to retire the layout and start working on the next one. For example: One 6’x10′ space, one power connection, two chairs plus a table, lodging for two people for the night before the show as well as every night of the show, and gas from such-and-such a location. Six by ten feet is a space that exists in most people’s houses. In theory, you could take the layout to your friends house for him to see. I don’t know if this is appealing to me or anyone but it’s what I thought. Maybe one layout for a group of friends to share? One week you want to work on it or just play with so it’s at your house…there’s something here I’m curious to think more about. It feels like it goes beyond finding space for a layout in a small home or any of the traditional small layout propaganda. Something about the relationship between the modeler and his work and considering this hierarchy: does the modeler serve the layout or the other way around? Another very realistically designed and presented layout. The trackwork quality of the Roweham line is excellent! Thank you for sharing. 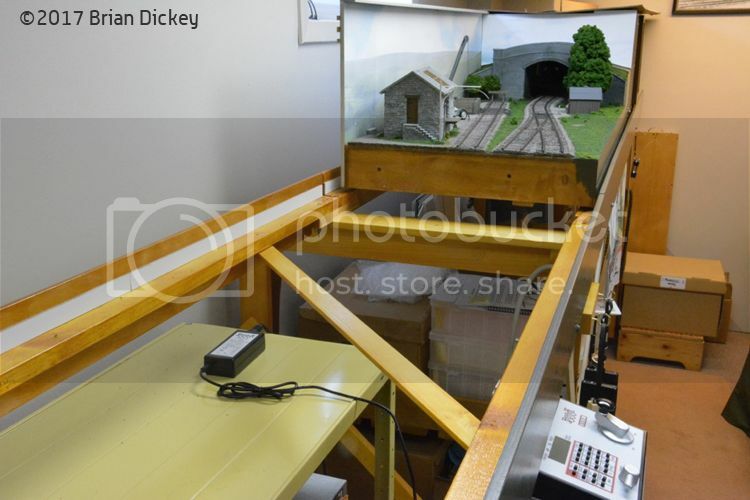 I think it adds a lot to the realistic look and feel of a layout if track isn’t laid all over every square inch of available real estate – your Port Rowan branch is another perfect case in point. When I get a chance to build the model of a branch line I’m familiar with and had the chance to ride, I want to keep it as simple and faithful to the prototype as I can. A smaller, simple layout, whether based on an actual rail line or not, can be just as interesting to operate as a larger, complex pike if the design is well conceived and laid out. I agree, David: There’s a nice proportion of track to scenery on Brian’s layout – as shown in the overview photo I took on Saturday. One can certainly see there’s room on the baseboards for more track – but at the (too great) expense of placing the railway in context. I think Brian has hit a sweet spot in terms of the balance between appearance and operation. I left out a crucial “h” in my earlier post: I meant to write that “FREMO has a lot of attractions” which came out “FREMO ‘as”. The idea of FREMO is great but even as someone favorably disposed to the idea, I found that the rough execution of much of the work undermined my interest, just as Chris suggested above. One observation I made at the show, but did not make in this post, is the size of British O scale (7mm/1:43). It’s an ideal subject for an exhibition layout, because it has the presence of North American O scale (1:48)… but, length-wise, most equipment occupies the space equal to HO standard gauge equipment. The exception on Brian’s layout is the auto trailer (passenger car), which is definitely O scale. But the 0-4-2 and 0-6-0 tank engines are remarkably stubby, as is the small, four-wheel freight equipment. What this means is that we were able to run a goods (freight) train consisting of a locomotive, four to five freight cars, and a guard’s van (caboose) – and it took up about the same track length than an O scale GP-9 and two fifty-foot boxcars. From an operations perspective, we had a six-car train, versus a two-car train. That’s a big benefit on a small layout, where switching comprises most of the fun. Some might be wondering where five freight cars would go on Roweham. Well, the goods siding held four, and would require a lot of back-and-forth moves to pull outbound cars, spot inbound cars, and make sure everything went into the siding in the right order. At the other end of the layout, the tail track on the loop (run-around) served a cattle dock, with space for a fifth car. Space beyond the cattle dock could be used for “off-spot” cars, if needed. Doing the same layout design as Roweham, but designed for North American equipment, would require dropping down to HO scale, or doubling the length of the layout – if one wanted the same amount of operating challenge. Aye, but those two fifty-foot boxcars would hold a lot more than the five British freight cars. True, Simon… but capacity doesn’t add to play value. I’m reminded Of the layout designer’s rule that an industry that requires five cars, each of dofferent types and to be spotted in unique locations, offers more play value than an industry that receives 50 cars of one type (for example, a power plant receiving coal). Depends whether you want “play value” or an authentic representation of prototype workings! My observation was to comment on a key difference between North American and British practices at that time, simply the amount of “stuff” being moved. We often look at the size of rolling stock, but overlook the capacity of it. Well, both can be prototype workings, Simon. But I’d suggest that at an exhibition, giving the operators something to do – and the public something to watch – is important. And in any given scale and space, the shorter equipment of British railways trumps North American models in terms of number of cars to move about. We didn’t go for specific “spots” over here. Unless there was a specific need, such as unloading cattle, the whole raft of wagons might be simply pushed into a siding. As anywhere, railwaymen have enough to do without creating extra shunting. 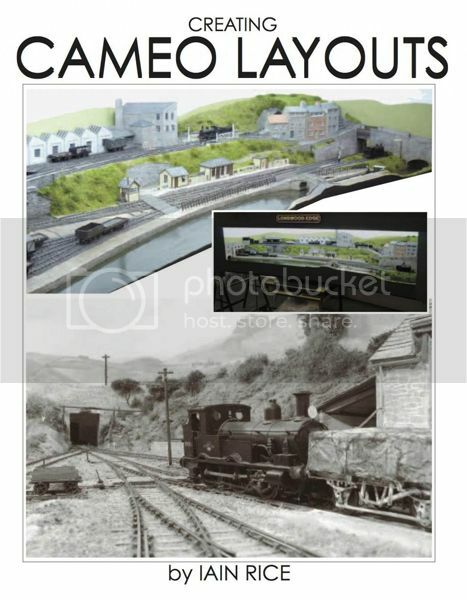 Based on the liveries (paint schemes) in use, the layout depicts an era when many goods trains might consist of very few wagons, too, especially a station with that small a goods yard. A short freight with a gondola, box car and caboose is also more impressive than a 7-plank open, van and brake van. It’s all (iron) horses for (model railway) courses. Further to this discussion on Presentation, Gerard Fitzgerald provided me with some photos and a write-up of the McCook’s Landing US Civil War exhibition layout he built with some friends. All of this has urged me to start reading Iian Rice’s new book “Creating Cameo Layouts” from Wild Swan. The UK crowd seems to have mastered presentation and hopefully the ideas will catch on over here. This is certainly noticed when one visits the Great British Train Show in Brampton and sees what is on display there compared to the typical offering at other train shows. There is much that can be done to improve the product. I too have to read that book. I received my copy a few weeks ago (via the Titfield Thunderbolt Railway Bookshop in the UK) but then I got busy with other things. An excellent post about a very good layout and day out. However some of the comments read as if people are getting scales and other terminology a bit crossed. The coach appears longer because the prototype is longer, not because it’s British O scale (7mm to the foot). For the record, the normal 4 wheel British goods wagon was based on a 16 foot underframe, and this was standard British freight wagon until around the 1970’s. And, because of population densities and land availability, many of the prototype UK railway stations and goods yards were also short – much shorter than the typical American site – which is an aid in their small scale representation. I am intrigued by your positive response to 3-link couplings. Yes, they can be fun, but they are more work than a scale knuckle coupler, such as the Sergent coupler which you stopped using some time back. My problem with the Sergents was not the amount of work required to use them. My problem was that they were not reliable. I would make a coupling – and they wouldn’t couple – usually because I had not lined up the knuckles properly, and sometimes because when hitting the car, the ball bearing in the coupler would not drop to lock the knuckle into place. Another proof you can’t have everything. This man made the courageous decision to focus his efforts on a level he could handle. Not only he achieved quick results, but he now has the leisure to step up his game as much as he wants. The three-link coupler gimmick would get old quickly on a basement filling empire, but becomes a major asset at a “single station scale!”. Maybe it’s my own bias, but I’m getting more convinced as years goes by that electing to represent only a part of a system is most of the time the best decision for most folks. I’m pretty sure Brian wasn’t a one-of-a-kind genius but a regular modeller that improved thanks to his dedication to master what he could chew. Really inspiring example and it conforts me in my choice of going small with my Connors project. I also like his idea to install the layout on a shelf at home, I’m was planning to do the same thing. Further to the discussion of presentation, my friend Stephen Gardiner has just posted on his blog about creating display frames for some of his work. The first photo in his post immediately demonstrates their worth.